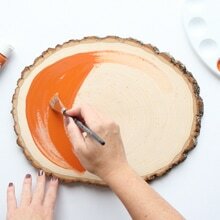 Wood slices add the perfect rustic touch to fall decorating and make wonderful canvases for a little painting project. You may remember our wood slice Christmas ornaments from last year. 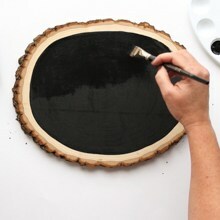 See how to give one wood slice two distinct looks including as a wood slice pumpkin chalkboard. RELATED – Our wood slice pumpkin project is reversible, just like our reversible scarecrow snowman sign for your front porch, and our reversible wood pumpkins and snowmen! Hi crafty friends! 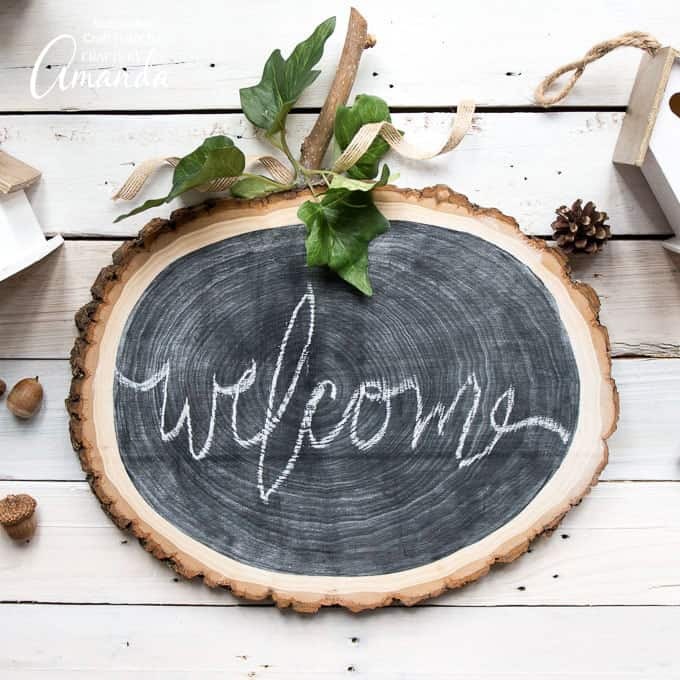 This is Jane from Sustain My Craft Habit, a nature-inspired DIY, craft and home decor blog I write with my sister Sonja. 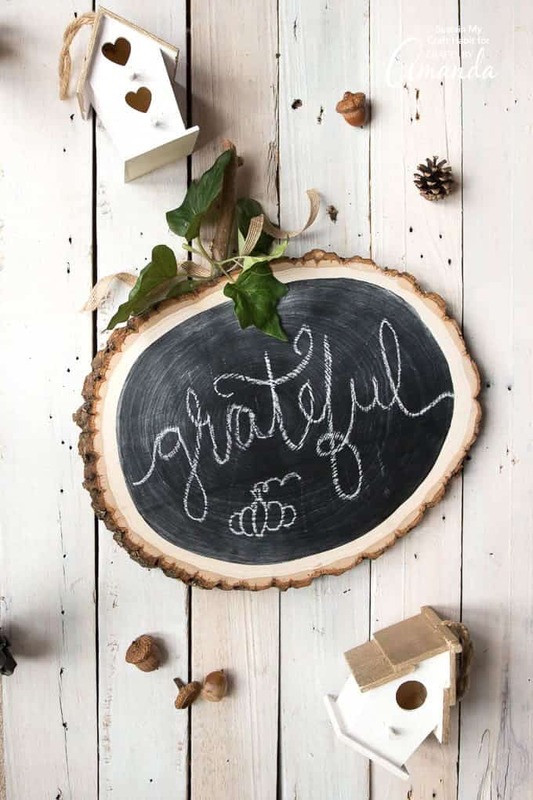 Fall is one of our favorite times of year for decorating! We are drawn to natural textures and materials and there’s nothing like displaying found and foraged objects such as acorns, pinecones, and wood. Last year we shared Sonja’s rustic chic fall home tour which included a whole woodland inspired Thanksgiving tablescape. This reversible wood slice craft would have been perfect to display last year, but we’re happy to have it now! 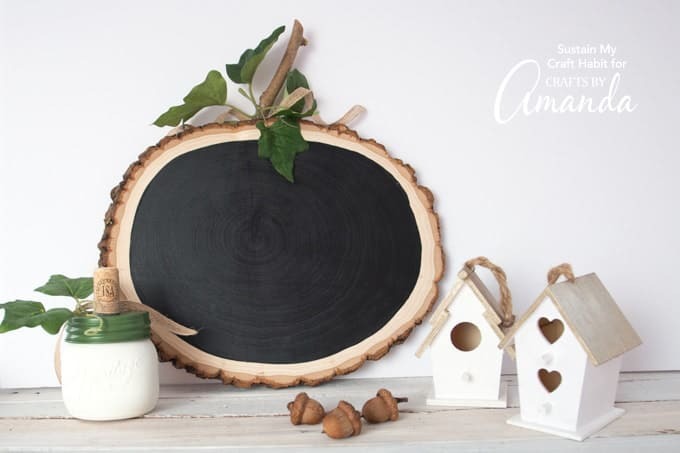 One side is perfectly rustic with an orange chalky finish, whereas the other side is more modern and functional as a mini chalkboard. 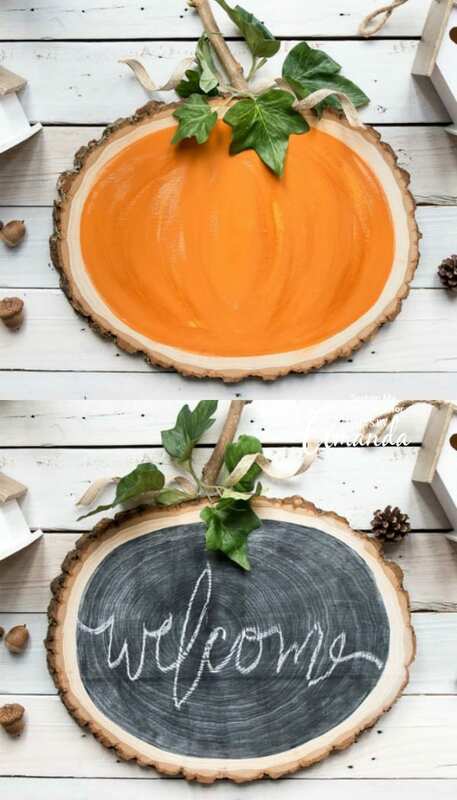 Do you have a favorite fall quote you would write on your DIY wood slice pumpkin chalkboard? 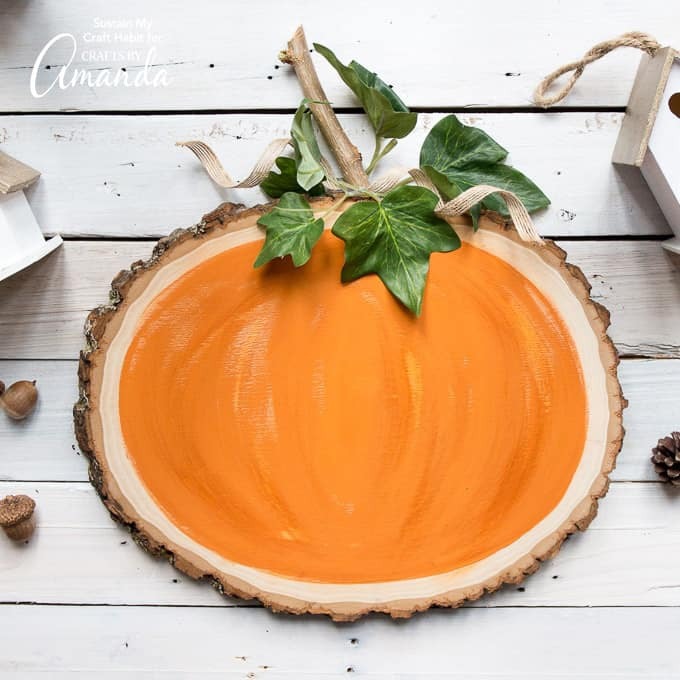 Decide whether your pumpkins will be tall or wide (as ours is) and place the wood slice on a flat surface in front of you. 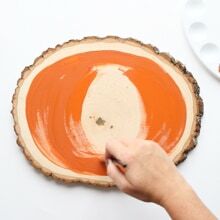 Start by painting a large oval using the Heritage color paint, leaving about ¼-inch of the wood slice exposed between the bark and the paint line. Continue from one side of the wood slice to the other, working in curved wedge sections (like the sections on a pumpkin). Leave some sections very lightly painted, or even unpainted for the truly worn, rustic look. 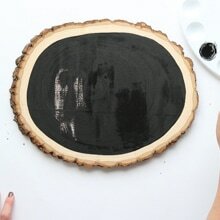 Once painted, let dry completely (at least one hour). Once dry, lightly sand sections of the “pumpkin” to accentuate the wedges you painted. Gently wipe away any paint dust with a clean cloth. Turn the wood slice over. 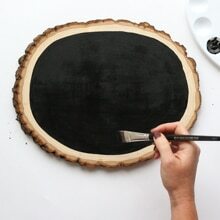 Again, paint an oval onto the wood slice surface, leaving a ¼-inch border of exposed wood all around. 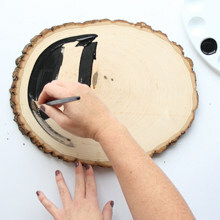 Paint the first coat with vertical strokes and then let dry for at least one hour. 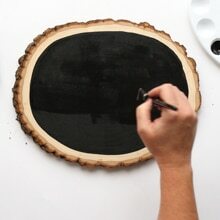 Paint a second coat of chalkboard paint, this time with horizontal strokes. Let dry completely. 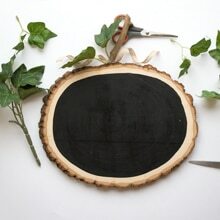 Note: Prior to using the chalkboard, you may want to “prime” it by lightly running a piece of chalk in all directions over the surface and then wiping it off with a damp cloth. 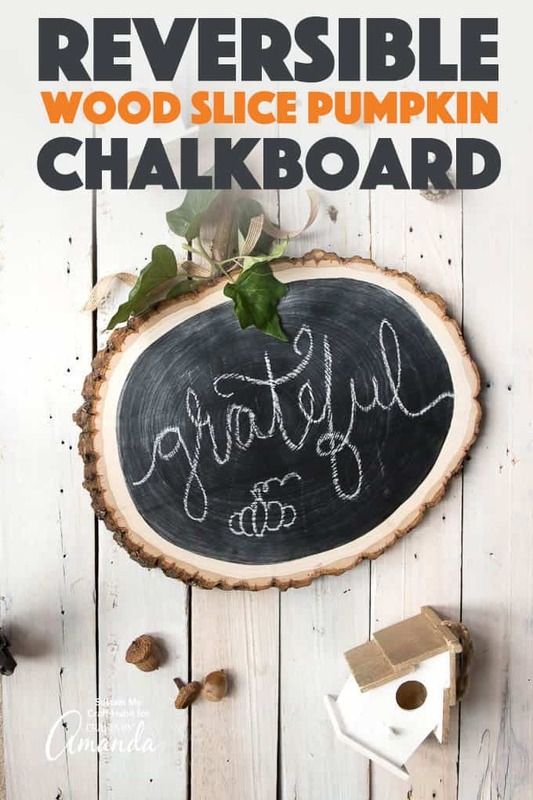 This will help to keep your writing from imprinting onto the chalkboard surface. I cut a 4-inch long stem from my mulberry tree out front of my house. Use any type of branch you have or even a wine cork instead. 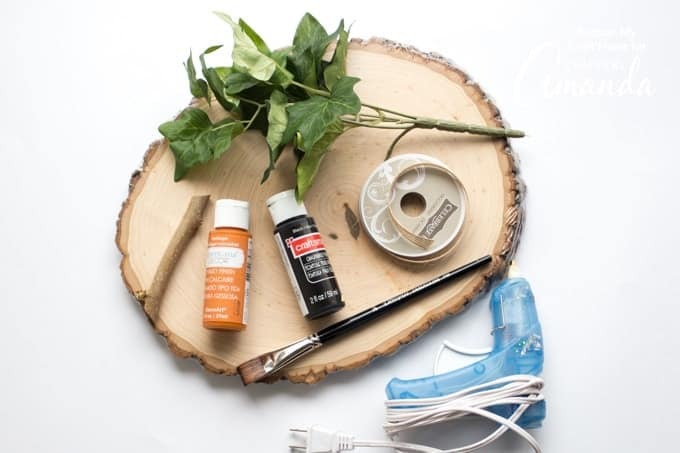 Glue a curled piece of ribbon to the top of the wood slice using the hot glue gun. Glue the stem on top of the ribbon. 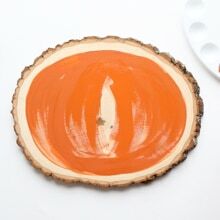 Add several leaves hanging over one side of the wood slice pumpkin and then turn over and glue a few to the other side. That’s it! You now have a beautiful, multi-purpose piece of decor that you can just flip around to get a completely different look. I particularly like the message board which can also be changed up with all kinds of different colored chalks. I’m just waiting for my kids to notice it! For more creative fall crafts you may like Jane and Sonja’s glittering Silent Night wood slice ornaments, as well as this burlap wreath, these mason jar lid pumpkins, and this burlap pumpkin wreath! 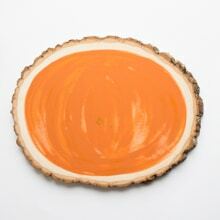 Wood slices add the perfect rustic touch to fall decorating. 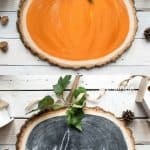 See how to give one wood slice two distinct looks including as a wood slice pumpkin chalkboard. 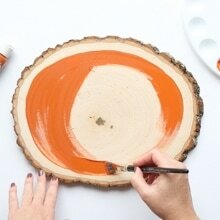 Paint a large orange oval leaving about ¼” of the wood slice exposed between the bark and the paint line. 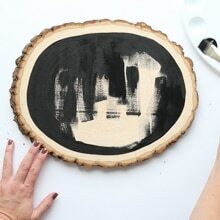 Continue from one side of the wood slice to the other, leaving some sections very lightly painted, or even unpainted for the truly worn, rustic look. Let dry completely (at least one hour). Lightly sand sections of the “pumpkin” to accentuate the wedges you painted. Turn the wood slice over. 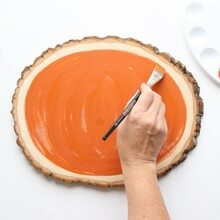 Again, paint an oval onto the wood slice surface, leaving a ¼” border of exposed wood all around. Paint the first coat with vertical strokes and then a second coat with horizontal strokes. Let dry completely. 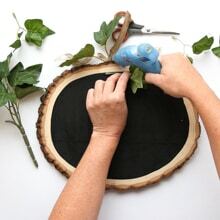 Glue a curled piece of ribbon to the top of the wood slice using the hot glue gun. Glue the stem on top of the ribbon. 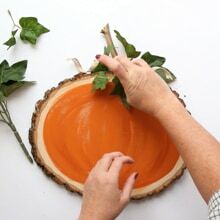 Add several leaves hanging over one side of the wood slice pumpkin and then turn over and glue a few to the other side.